Gov. Cuomo unveiled a plan on Tuesday to give low- and middle-income New Yorkers a free pass to state colleges and universities. Flanked by Vermont Sen. Bernie Sanders, Cuomo said the program — dubbed the Excelsior Scholarship — would offer free tuition at state colleges and universities to any family earning $125,000 a year or less. Cuomo said the program, which would require approval by the Legislature, would combat the rising costs of college and the rising debt faced by students, whose load averages about $30,000 in New York. Annual tuitions range from $6,470-$6,330 at SUNY schools and from $4,350-$4,800 at CUNY. Administration officials said the program would impact more than 940,000 households and cost about $163 million a year once it is fully implemented over three years. The scholarships would be offered at both two- and four-year colleges but would not include room and board. Sanders, who made free tuition a centerpiece of his Democratic presidential campaign last year, praised Cuomo’s effort. “What Gov. 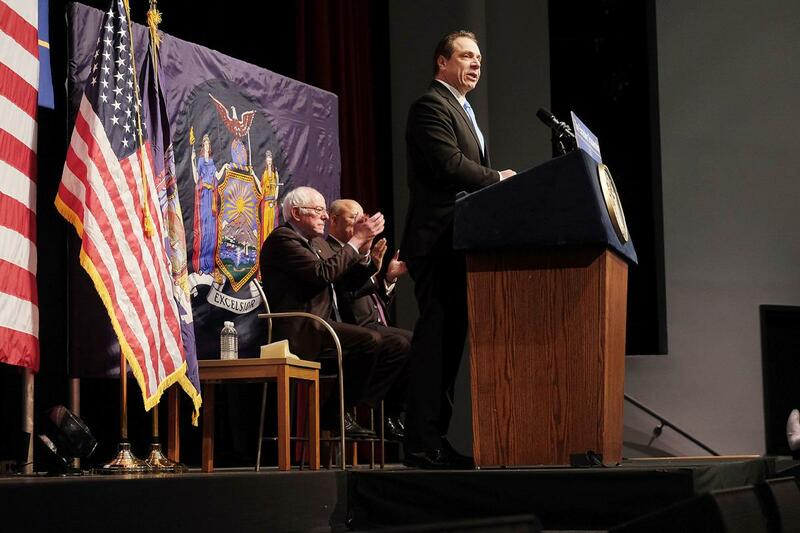 Cuomo is proposing is a revolutionary idea for higher education,” Sanders said. State legislative leaders reacted cautiously to Cuomo’s proposal, which will likely be included in the upcoming negotiations over the state’s 2017-2018 budget. ALBANY — Gov. Andrew M. Cuomo seized on a potent issue that energized younger Democrats during the presidential race, pledging on Tuesday to cover tuition costs at state colleges for hundreds of thousands of middle-and low-income New Yorkers. Under the governor’s plan, college students who have been accepted to a state or city university in New York — including two-year community colleges — would be eligible, provided they or their family earn $125,000 or less a year. Mr. Cuomo, a Democratic centrist thought to have presidential ambitions, has tracked left on a series of issues during his second term, championing a higher minimum wage and paid family leave, though he continues to face criticism from some progressive groups over sometimes working closely with Senate Republicans. Some of that criticism could be softened by Mr. Cuomo’s embrace of a plan that was so closely identified with Senator Bernie Sanders of Vermont, who spoke forcefully during the presidential primary campaign of surging college costs and collective student debt topping $1 trillion. “That is a message that is going to provide hope and optimism for working-class families all across the state,” the senator said. If Mr. Cuomo’s proposal goes forward, it will place New York at the forefront of such efforts; Tennessee and Oregon have programs to cover the costs of community college. The governor’s plan would include four-year schools, including dozens of campuses that are part of the state university system, as well as the city’s university system — a once-free network whose tuition has risen and reputation has fallen over the last decade. Under the proposal, the state would complete students’ tuition payments by supplementing existing state and federal grant programs — essentially covering the balance, though administration officials said some students could have their entire four-year education covered. In his remarks, the governor — who had endorsed and campaigned for Hillary Clinton, Mr. Sanders’s opponent in the primary — picked up the senator’s mantle, arguing that student debt was crippling the prospects of generations of young Americans. “It’s like starting a race with an anchor tied to your leg,” Mr. Cuomo said, adding that many students in New York and elsewhere left college $30,000 or more in debt. Still, Mr. Cuomo’s plan would affect a far smaller pool of students than federal proposals. Initial estimates from the administration said the program would allow nearly a million New York families with college-age children, or independent adults, to qualify. The actual number of students receiving tuition-free education would probably be about 200,000 by the time it was fully enacted in 2019, according to Jim Malatras, the director of state operations. It was likewise unclear how much the program would cost. The administration estimated that the state’s annual outlay would be $163 million by 2019, though it acknowledged that estimate could be affected by participation and level of need. New York already offers in-state students one of the lowest tuition rates in the nation. Current full-time tuition at four-year State University of New York schools for residents is $6,470; at two-year community colleges, the cost is $4,350. Full-time costs for City University of New York schools are about the same. The state also provides nearly $1 billion in support through its tuition assistance program, which has an adjusted gross income limit of just under $100,000. Those awards top out at $5,165; many grants are smaller. Costs for the state could also rise as enrollment rises. Some 400,000 students attend state or city universities full time, but the administration projects that the lure of a tuition-free system could increase the student population by 10 percent by 2019. Estimates for other free-tuition proposals have said that costs would be even higher. A 2015 report by the city’s Independent Budget Office put the cost for the city’s community colleges alone at $138 million to $232 million. But Mr. Malatras expressed confidence in the administration’s estimate, saying it had calculated costs considering a variety of factors, including the number of students receiving money through federal Pell grants, the state tuition assistance program and tuition credits. But even some supporters expressed some doubt about how much Mr. Cuomo’s plan could cost the state. “The cost estimate of $163 million begs the question: If it costs so little, why haven’t we done it before?” said Assemblywoman Deborah J. Glick, the chairwoman of the Assembly’s Higher Education Committee. The tuition plan will require legislative approval, a potential challenge when the governor and lawmakers have been at odds over a raise and other issues. On Tuesday, Democrats and Republicans offered qualified support for the plan, saying they wanted more details on the proposal and adding that each party had also worked to lower tuition. “We are pleased to see the governor join us in our efforts,” said Michael Whyland, a spokesman for Carl Heastie, speaker of the Democrat-dominated Assembly, noting that his fellow Democrats had made similar proposals for free tuition in the past. Scott Reif, a spokesman for the Republicans, who rule the Senate with the help of a group of breakaway Democrats, said his party had “been fighting for years to expand TAP eligibility,” referring to the tuition assistance program. “This proposal appears to move us in a positive direction,” he said. Bruce Gyory, an Albany-based political consultant, said the governor’s announcement would appeal to the voters who flocked to Mr. Sanders during the Democratic presidential primaries last year — and to voters with some college education but no degree, who swung to Donald J. Trump in the general election. Such voters made up nearly a third of the electorate, according to exit polls, Mr. Gyory said. Students and faculty also seemed intrigued by the proposal. Katie Montwill, a junior studying health science at Stony Brook University, called the idea “pretty awesome, on the outside,” though she added she was not sure how it would be funded. Ms. Montwill, 20, also suggested that the idea of tuition-free education might not sit well with some parents — including her own — who did not want their tax dollars to help put other people’s children through school. “I feel like my parents wouldn’t be for it,” she said. United University Professions, which represents 35,000 faculty members at New York State campuses, offered support for the plan but also argued for more full-time faculty, a sentiment echoed by other groups. For his part, Mr. Sanders — who was greeted by shouts of “I love you, Bernie” and loud cheers by the crowd in Long Island City — was effusive in his praise of Mr. Cuomo’s idea, calling it “a revolutionary idea for higher education” that he envisioned would be emulated elsewhere. New York Gov. Andrew Cuomo on Tuesday proposed free tuition at state colleges. "A college education is not a luxury – it is an absolute necessity for any chance at economic mobility. ... We're providing the opportunity for New Yorkers to succeed, no matter what ZIP code they come from and without the anchor of student debt weighing them down," the Democrat said. "New York is making a major investment in our greatest asset – our people." The plan, which will make college tuition-free for middle-class residents at State University of New York and City University of New York two- and four-year colleges, requires legislative approval. Cuomo's office noted that under the proposal, "more than 940,000 middle class families and individuals making up to $125,000 per year would qualify to attend college tuition-free at all public universities in New York State." Cuomo appeared with Sen. Bernie Sanders, I-Vt., at an announcement at LaGuardia Community College in Queens on Tuesday. Sanders' proposal for free nationwide public college tuition was a central proposal of his 2016 presidential campaign. "I am honored to have the support of Sen. Sanders, who led the way on making college affordability a right," said Cuomo, who is rumored to have presidential aspirations himself. 0 Response to "Cuomo proposes free tuition for low, middle income New Yorkers"